With around two weeks to go before the Galaxy Note 9 is announced, some high-quality images of the upcoming Samsung flagship have leaked. A trio of Galaxy Note 9 images have been shared by prominent leaker Evan Blass. Included are black and brown versions of the device with matching S Pen as well as a blue handset with a bright yellow S Pen. As many have expected, the Note 9 looks fairly similar to the Note 8. It’s got an Infinity Edge display, slim top and bottom bezels, a dual rear camera setup, and a rear fingerprint reader. One of the biggest changes with the Note 9 is the placement of that fingerprint reader, though, with the Note 9 moving it to below the rear cameras rather than to the side like on the Note 8. This ought to make the fingerprint reade reasier to reach. 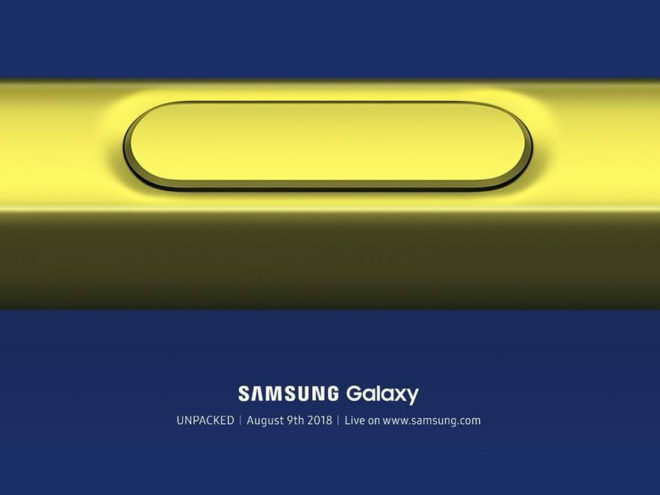 Samsung is hosting an event on August 9th, and it’s likely that we’ll get to officially meet the Galaxy Note 9 there. There’s no word yet on when the device might actually launch, but a launch on T-Mobile and other U.S. carriers shortly after the announcement seems probable. No. Millimeter wave will be used for 5G, not LTE. It will work with 600 band just like the s9 and the s8 active. Only reason the 8 didn’t was because it was already in development. Yes, that is why i didn’t say it would come with it, just 600. Tmobile ceo has said currently no phones in the near future will have that. Go ask them on twitter. they did state that phones would start coming with millimeter wave the second half of this year and the beginning of next year. Does anyone else find it odd that the blue is the only color shown so far with a differently colored S-Pen? I like it & that’s more than likely the option I’ll go for, but I just think it’s strange that it might be the only one. Do you actually think T-Mobile will offer the blue one? Really? These articles do nothing but play with people’s emotions. Don’t get your hopes up. Oh. I’m shocked! Of course they make people pay a premium for the Plus version, just to get blue. They offer both in the blue, not just the Plus version. Who peed in your cereal this morning by the way, man? They’re just phones. Relax. I don’t really care what T-Mobile offers. I buy my phones directly from Samsung anyway. Take your pessimism elsewhere, man. The warranty process is much more tedious. I would much rather be able to have a replacement sent in MOST cases, very next day for $5. Also, If you don’t get the T-Mobile model, you don’t get all of the low band frequencies. I am just assuming that you have TMobile posting that comment. I do have the T-Mobile model. Samsung sells each carrier’s model separately on their website. I bought my Note 8 from Samsung directly last year because they offered $425 off to people who had a Note 7 previously so I only paid $505 for it. I would have had to pay full price with T-Mobile. I haven’t had any issues with them so I’ll likely do it again. Rumors it could be a Best Buy exclusive…they had an exclusive US blue one for the Note 8. That would be disappointing. Best Buy doesn’t carry T-Mobile phones. The more I look at the new Best Buy logo with so much blue & a little bit of yellow, the more I think you’re right. I really hope not though. Samsung should hold off a bit in regards to new devices. Most are starting to look a bit similar to each other. A redesign in a couple years would benefit the Galaxy line of phones. They follow the same refresh period every year…Galaxy s6 was big redesign for them and the s7 was a refinement. The s8 was a big redesign and again, the s9 was a refinement. The s10 will be a redesign. Samsung Reps have these in hand and are showing them to stores now. I got to spend some time with the device and can say it’s a good refinement of the note 8. I’d say it’s worth the upgrade from the note 8 due to battery improvements, new s pen features and speakers as well as software improvements.